Since ages mothers have used cloth as the only diapering solution until the disposables arrived. Disposables surely do make life easier for the new-age mom, who is constantly on her feet and trying to manage home and work. But today we see a change in the pattern, with quite a few moms going the cloth way. No doubt disposables are pretty easy to use with no maintenance efforts, albeit they come at their own cost. The major disadvantage I feel is the cost itself. Till a kid starts to potty train, one has to keep buying regular diaper stocks and even if you get bulk discounts, yet that’s a lot of dollars we are talking about. This leads to many parents using disposable diapers for a longer duration of time and stretching them to the limit, which in turn is not very good for the baby. While I haven’t myself done in-depth calculations, there are many out there who have. Where over a period of 2 years, at a minimum $900 is spent on disposables, cloth diapering can be achieved at a third of that cost! This calculation I believe takes into account that parents wash diapers at home and do not use a laundering service. Also, cloth diapers can be reused for siblings later! How long should I use one disposable for? Diaper companies tend to advertise that you can use disposables for as long as 12 hrs, and that might very well be true in an ideal scenario. But I remember nurses telling me when I had my little one, to change her every two hours. That does seem like a very short time, right? But then imagine lying in a wet diaper for 12 hours? I do realize most parents wouldn’t have the time to change babies every 2 hours, but in a practical scenario, I have seen 4 hours works fine for me. A small experiment can prove how different cloth diapers and disposable diapers are. Make your baby wear a disposable diaper overnight vs make her wear a cloth diaper overnight. Wearing a cloth diaper, baby wakes up stinking of pee, whereas with a disposable this doesn’t happen. Imagine the amount of chemicals in the disposable that hold off such strong urine smell! The best thing about using cloth diapers is the reduced diaper rash. With disposables, babies are bound to get diaper rash at some point of time, even if you give them some diaper-free time. With cloth diapers, rash instances drop down significantly. The biggest downside of using cloth diapers is, of course, the maintenance. One has to spend a decent amount of time first learning the tricks of the trade and getting into the cloth diapering world learning the jargon. Then start off with first prepping the diapers, then washing them regularly, sunning and drying them etc. For a busy mom, that might be a lot to handle and she might just discontinue the journey. But most cloth diapering vendors nowadays have starter kits that can help beginners decide what suits them best. With cloth diapers, the journey also evolves for a mother. 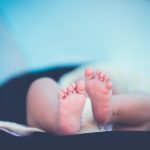 One might start with flats and prefolds for newborns, who have softer skin, and then progress to newborn pockets or AIOs. Some never seem to like pockets due to the tedious process of inserting soakers every time. Some prefer using prefolds and then finishing off with a diaper cover. There’s a lot of experiment out there in the cloth diapering world. The best scenario would probably be cloth diapering baby most of the time, but for night times or travels stick with disposables. That way a parent can balance between the best of both worlds.